Wash and dry like a dream! We will be ordering more. Great quality! I recently received my new long sleeve black shirt. It's nice to have something a little bit different than just the regular CanAm shirts. It fitseems just like I wanted it to. The photos do not do this shirt justice. Great quality and the material seams like it will last for a long time. Love these shirts. They are good quality but do seem to run a little small. I usually get a large shirt but needed an extra large in this particular shirt. I would still buy them again and recommend them. 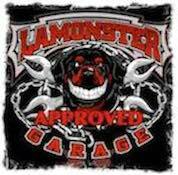 Very good quality as we have come accustomed to from Lamonster. Of course the free shipping is always great.